The Sharon's Delight quilt block fits into several categories of block, with regard to construction. I have chosen to demonstrate this as a four patch but it could also be constructed as a nine patch if you choose to do so, or even in six individual rows. 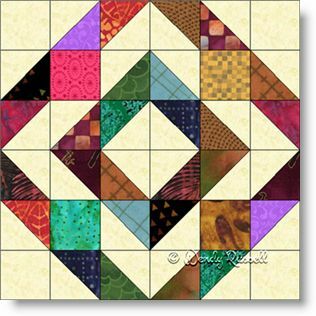 This quilt block has easy components -- only squares and half square triangles -- but care must be taken to ensure an accurate 1/4" seam allowance in order for the patches to be constructed precisely. Don't let that information make you shy away from making this wonderful block -- either as a colour coordinated pattern, or as a "scrappy" version as I have shown here. This time I have created three sample quilt layouts. (I just couldn't help myself!). As you can see there is no end to the creativity when it is time to decide on how your quilt will look, once the quilt blocks have all been sewn.